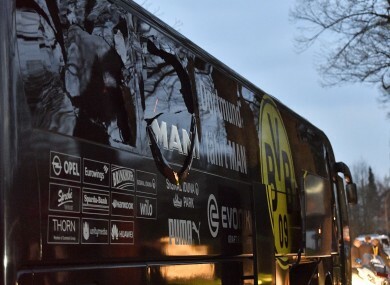 The damaged Borussia Dortmund bus. THREE EXPLOSIONS WENT off near the Borussia Dortmund bus this evening — injuring Spanish international defender Marc Bartra — as the German team headed for a Champions League match against Monaco. Bartra was taken to hospital and the quarter-final first-leg match has been postponed until 5.45pm tomorrow because of the attack. The bus had set off from the team hotel for the Borussia stadium about 12 kilometres away when “three explosive charges detonated,” said a police spokesman, Gunnar Wortmann. He added that the bus windows were shattered and one person inside the vehicle was wounded, without giving further details. Dortmund CEO Hans-Joachim Watzke said Bartra, 26, suffered a hand injury and was being treated in hospital. The announcement that the game has been postponed until Wednesday was only made to the stunned stadium about 15 minutes before the game started. Germany has been on a high alert since last December’s attack in Berlin, when a Tunisian national hijacked a truck and rammed it into a crowd, killing 12 people. Email “Champions League tie postponed after explosions near Dortmund team bus injure player”. Feedback on “Champions League tie postponed after explosions near Dortmund team bus injure player”.